Smuggler info, Fan Fiction Contest Deadline approaching, more links from the HoloNet & What do you get a One year old Red Rancor??!! 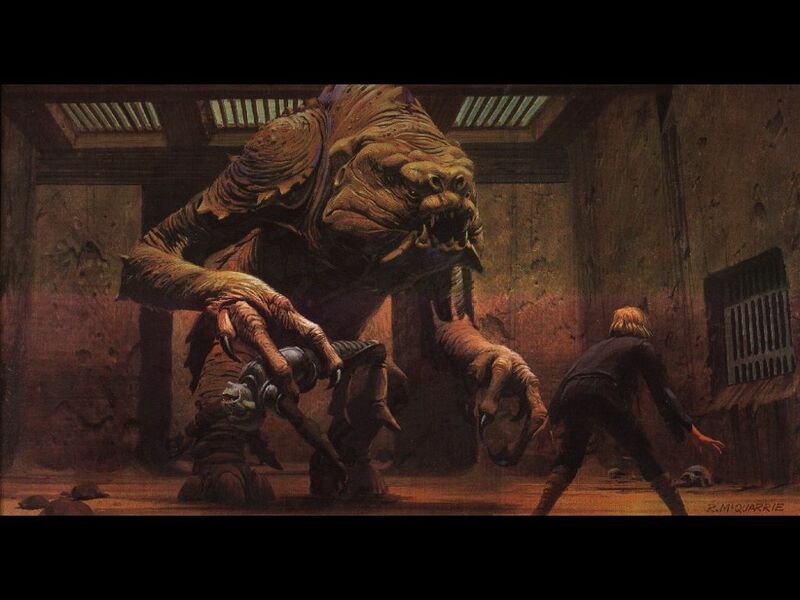 Lucky for us this Red Rancor is a great fansite covering The Old Republic, and not a hungry Rancor…that is known to make a real feast out of visitors. August 9th was Red Rancor’s one year anniversary of open up the website. It is a good source of information and has some awesome video productions. The videos cover topics from weekly updates, class videos, dev notes, and they just announced that they will be covering live game coverage when SWTOR launches. If you get some time I would urge you to go check them out. Oh, I didn’t know this thread was “Is TOR a spiritual successor to SWG?” What a stupid and pointless debate. On topic: I’m disappointed that Gunslinger doesn’t seem to really use or rely on cover in PvP at all, according to the impression, and that’s actually quite worthless. I understand why. The devs couldn’t balance it and make it work, so they essentially just scrapped it as a core mechanic. Still, it was a unique “core” mechanic, and something the Gunslinger was especially supposed to focus on. No longer, I guess. Except that that impression is totally wrong. The Gunslinger has an entire tree dedicated to cover gameplay that is very, very competitive. It’s not everyone’s cup of tea though, so that’s why there are multiple specs available that rely to varying degrees on cover. We’ve yet to actually see any viable cover in PvP though. There may be PvE cover specs, but it would be nice to see some reports of cover being something other than a burden in PvP. Georg didn’t mention anything at all about cover’s PvP viability and HOW it’s viable. Other reports of cover classes in PvP have made it sound like cover is a poor mechanic in PvP, to smuggler’s/AI’s disadvantage. For the cover specs, cover is very viable in PvP. The ability to entrench grants them immunity from a wide range of effects, including ballistics and makes them impossible to charge. Their superior range means they are guaranteed to get the first shot, which could be a powerful alpha strike, a snare or one of several other options. A Smuggler can be a Medic, healing and supporting his allies. A Smuggler can be a marksman, entrenched in cover and decimating the enemy with devastating single target attacks. A Smuggler can be an explosives specialist, leaving craters and blown up Imperial squads in his wake. A Smuggler can be a stealthy mid range scrapper, approaching enemies unseen and hitting them hard with his scatter gun. A Smugger can be a daring risk taker, running and gunning into close range and finishing enemies with a few good kicks into places where it hurts. A Smuggler can be a Smuggler, delivering his group behind enemy lines unseen. As you can see, saying ‘a Smuggler plays like this class from another game’ is never going to be terribly accurate. I’d say, it’s probably wrong. In this part of Dev News, we look at Georg Zoeller and his elaborations on Smugglers in PVP and abilities. This is a huge thread and many are voicing their opinions with the Smuggler class. I think there might be some valid concerns, but Zoeller does a great job of highlighting the Smuggler’s skills and abilities being able to fit certain players and their play styles. Check out the above excerpts and also be sure to read the thread for all you soon to be Smugglers and even the mirrored Empire class, Imperial Agent. There are no plans to ‘region lock’ or ‘IP block’ players from the game. You may experience some latency issues if you’re not playing in a launch territory. Anyone who pre-orders The Old Republic and redeems their pre-order code will be eligible for Early Game Access. Those eligible for Early Game Access will be able to download the game client before it starts. There will be a period after launch day in which those who have pre-ordered will be able to continue playing before entering their Game Code. More information on this will be made available closer to launch. We will accept credit card payments for subscriptions. These seem to be the key questions for those who choose to potentially import the game, and hopefully we’ve answered those. Stephen Reid answers some questions for those outside of initial launch area. Looks like no IP blocking and will be eligible for early game access also. There is a lot more in this thread make sure to check out the link, especially our friends not in the initial launch areas. StephenReid General Discussion -> Wiil there be an option to Disable Cutscenes? To answer the original question, no, there is currently no option to completely disable the conversation scenes in Star Wars: The Old Republic. BioWare is known for creating some of the best story-driven games in the world. Story is a key feature in every game we create. As such, we like to think that’s one of the reasons people play our games. We wouldn’t automatically give people an option to switch off a key feature. That said, the feature’s been discussed. There may be some benefit for people who are playing a class over again, for example. As of right now though, it’s not an option that’s in the game. As has been mentioned, while in a conversation you have the option to press space bar and skip a line of dialogue. You can go through and pick your conversation choices much more rapidly that way if you wish. Stephen Reid answers some about being able to skip the cutscenes. He says there is nothing to disable the cutscenes in settings, but you can hit your space bar to skip some of the dialogue. Not sure why you would want to personally, but hey I like story. Check out the link to this thread for more information. DamionSchubert General Discussion -> 2 (insert class)s, 1 quest. I’d still really like a reply on this from someone at BioWare, like Georg or Stephen or whoever, because my friends and I are setting up our starting group with everyone playing different classes, so that we don’t foul each others stories. The second Warrior to enter can choose whether to enter the first Warrior’s phase, or his own. You will know whose phase you are in by a large, hard-to-miss nameplate on your screen. As a general rule, the first Warrior cannot progress his quest while in the second Warrior’s phase, so if player B joins player A, he’d do it twice. Some players will choose to do so, other groups will prefer to split and have each Warrior do his own solo version and meet up again outside. It’s worth noting that in most situations, we try to make it so the phased bit of the dungeon is relatively small. One of the reasons why is to keep the replay of the areas relatively short, in these sorts of instances. Finally we get to this is a very interesting thread, about two of the same class and doing the same quest. Damion Schubert addresses this one. He states, that right now, the two of the same class would have to split or do they quest twice during the phase part. I did a terrible job explaining that, but be sure to read this thread and read Damion’s reply. While there voice what you think and also let us know here at CRR how you feel about this and how it might impact grouping. Fan Fiction Contest submission Deadline Approaching! I’ve had 4900 views (roughly in total) with many submissions! Which surpasses the previous competition by quite a margin since this competition isn’t over yet! There’s quite a few of really good submissions too, it’s always interesting to see how different people approach the classes. It’s also interesting to see how they interpret Bioware’s approach to the classes, which in turn influences how they write about that class. Here is a link to our article; Fan Fiction Contest has started…, talking about the fan fiction contest as well as all the important links. Unable to catch every article we have you covered with links to every article over the past week. Thanks to Roxanne for the link. It was posted in the Corellian Run Radio Facebook group. It is an interview from the New Yorker with voice actress Jennifer Hale. She will be the voice of the player character, as a female trooper and Satelle Shan, a female Jedi Master who fought Darth Malgus in the Hope game trailer. That’s all this week from the HoloNet Links at Corellian Run Radio. If you have an interesting, funny, or thought provoking Star Wars Old Republic link, please let me know via email at jason@corellianrun.com, join the CRR forums, or in the Facebook group. See you next week and remember each day that goes by is one day closer to launch!